Chinese character 十 is a number after "九"，which means Ten. If you were the creator of Chinese characters, how would you create a character which means ten? To get more ideas, you can review our post "Learn one Chinese Character a day - 九" first. It has been mentioned in our last lessons that original meaning of number "九" is "baby crawling around to explore and feel the environment surrounding him". Capability of standing up (and begin to walk) is the next milestone of a baby after crawling as the baby can move around further in a 3 dimensional space. 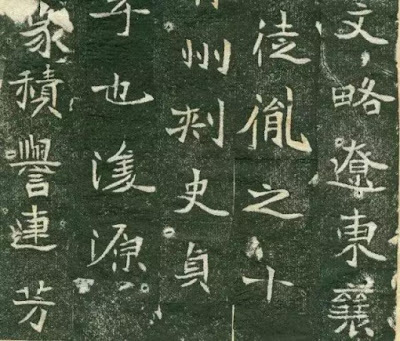 so Chinese ancestors used and to mean "10" after "九". Look at the Oracle Script , it is a simplified silhouette of a standing baby. When it evolved to Bronze Script , Chinese ancestors further emphasised that with a - which is a diaper wear by a baby. For it was hard to draw circle or dot on to the bronze vessels, as time passes, circles were simplified to squares and was eventually simplified to . Here we have changed to 十 during later stage of Bronze Script which is very similar to how we write it today - "十", which means Ten. And if you were going to create another Chinese character to mean Hundred, how would you create it along the logic path Chinese ancestors created 1 to 10?